Nosler has introduced a new 6.5mm (.264 caliber) hunting cartridge, the 26 Nosler. 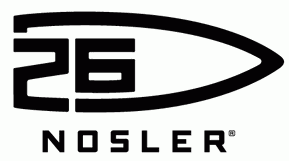 Nosler will initially offer 26 Nosler cartridge brass, and then, eventually, 26 Nosler loaded ammunition. This new cartridge is designed to be a speedy, flat-shooting hunting cartridge, with performance exceeding a 6.5-284. This is possible because the 26 Nosler is a big, long cartridge with plenty of “boiler room”. Length from base to neck/shoulder junction is 2.33″ for the 26 Nosler, compared to 1.91″ for the 6.5-284 (and 2.04″ for a 7mm Rem Magnum). The 26 Nosler has a 35° shoulder angle and a magnum-size 0.534″ outside rim diameter. The 26 Nosler cartridge can drive the Nosler 129 grain, AccuBond® LR bullet at 3400 fps. Zeroed at 350 yards, the 26 Nosler has a Point Blank Range of 0-415 yards. Loaded with the 129gr Accubond, the 26 Nosler retains as much velocity at 400 yards as a .260 Rem produces at the muzzle. This makes the 26 Nosler a “quintessential deer, antelope and long-range” cartridge according to company CEO/President Bob Nosler. Nosler has just released the SAMMI print for this cartridge. CLICK HERE for SAMMI Print PDF. Credit Grant G. for story tip. We welcome reader submissions. 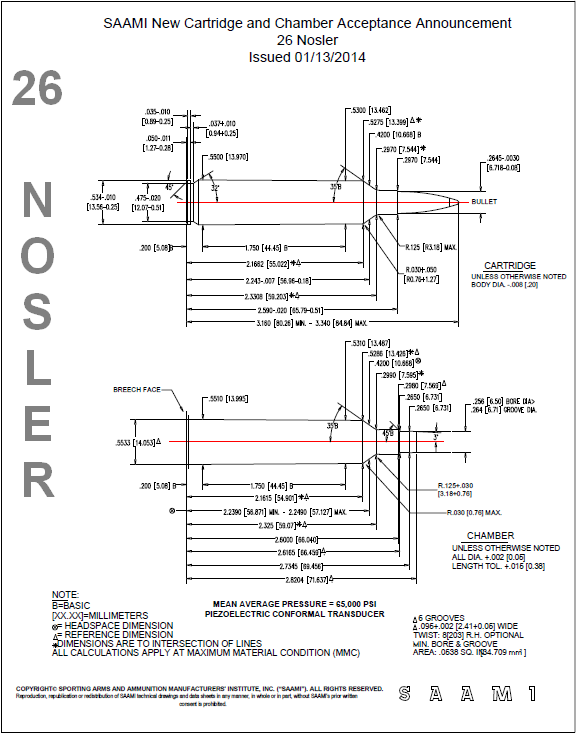 Share the post "Official 26 Nosler SAAMI Drawing Now Available"
Unfortunately, health concerns now prevent Dave Jennings from continuing his trade: “I am sorry to report that due to a recent spinal fusion surgery and the resultant permanent limitations on lifting and other movements, I can no longer operate MBW. If you are interested in buying MBW … I can provide information on current assests, inventory, etc.”. Any gun that you plan to shoot cast bullets from has to be cleaned of all copper jacket fouling first. The copper fouling is much harder than any cast bullet and will act like sandpaper on the bullet as it travels down the barrel. Not only will this lead to poor accuracy but may also give you signs of leading that really isn’t occurring. While testing cast bullets, it’s also important to keep your barrel free of leading. You may concoct a load that is a little too hot for the bullet/alloy you’re using and have a leading issue with that one load. If that leading isn’t removed before you fire your next test load, you won’t be able to tell which load gave you the problem. Moreover, leading is cumulative and will adversely affect the accuracy of subsequent shots. But don’t despair. I’ve shot literally hundreds of thousands of cast bullets and have found a quick and inexpensive way to remove leading. I use Bronze Wool, available from Brownells, either in the fine or medium grade. Unlike Steel Wool, Bronze Wool is softer than steel and will not scratch your barrel. Also, Bronze Wool is not oiled, so it leaves your barrel absolutely clean. Simply pull some threads of the Bronze Wool off of the pad and wrap it tightly around a slightly undersized bronze barrel brush. The tighter the fit, the faster it will remove leading. Ten to twelve passes up and down the barrel will remove all but the most severe leading. If you do this regularly, you’ll never have severe leading to contend with. Bronze Wool has become an integral part of my shooting kit for years. I wouldn’t be without it! Share the post "Montana Bullet Works Business for Sale"